The Medtronic/Covidien Curity™ Medium, 2 Ply Alcohol Prep Pads – item #5750, item #PR5750 are designed to effectively sterilize the skin. It is made with premium 2-ply non-woven material, these alcohol wipes are soaked with 70% isopropyl alcohol, are sterile and individually wrapped. The Medtronic/Covidien Curity™ Medium, 2 Ply Alcohol Prep Pads – item #5750, item #PR5750 quickly disinfect the skin from bacteria in less than 5 seconds. Each alcohol prep pad is individually wrapped in an easy open airtight, poly-lined foil pouch to ensure saturation and prevent dryness. 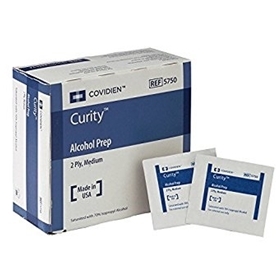 Medtronic/Covidien Curity™ Medium, 2 Ply Alcohol Prep Pads – item #5750, item #PR5750 are used in our holter kits because they provide a quick and reliable cleanse. Our customers use holter kits to prep patients for EKG/ECG procedures.